Blur Busters Forums • View topic - ROLL CALL: Who uses LightBoost=10%? ROLL CALL: Who uses LightBoost=10%? There are numerous people who likes the shorter persistence of LightBoost=10%, because the lower the LightBoost setting, the shorter persistence the strobe backlight becomes. NOTE: Mathematically, 1ms of persistence (strobe flash length) reliably translates to 1 pixel of tracking-based motion blurring during 1000 pixels/second motion (at framerate=Hz), so shorter persistence translates to less motion blur. For those who do not understand the relationship of persistence and motion blur, see the educational animations at http://www.testufo.com/eyetracking (animation of persistence) and http://www.testufo.com/blackframes (animation of motion blur reduction via strobing). Followup if you have used LightBoost settings lower than 100%, and you've noticed the motion clarity improvements (e.g. windows on buildings become sharper/crisper at http://www.testufo.com/photo#pps=1440 as an example, when you lower LightBoost % settings). Re: ROLL CALL: Who uses LightBoost=10%? 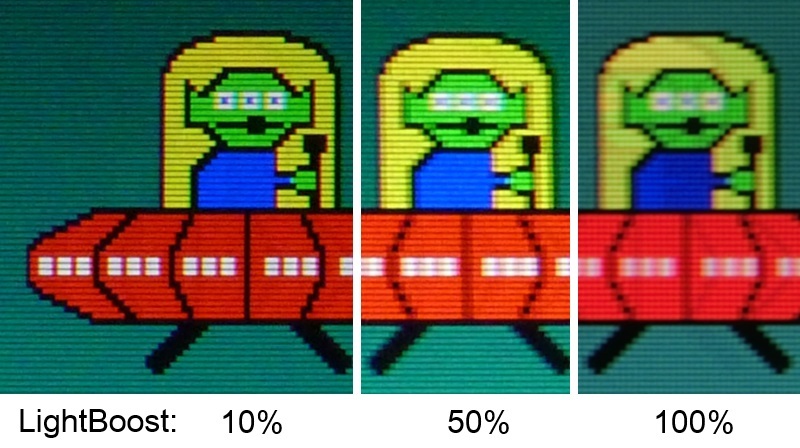 I used to use 10% and noticed motion was significantly more clear than the higher values. That was before I installed the GSYNC kit which doesn't seem quite as good as lightboost 10% in motion clarity but mostly makes up for it with better color. I used LightBoost @ 10% brightness exclusively in order to minimize motion blur as much as possible. The decreased brightness was noticeable at first, but I quickly became used to it. Now that I have ULMB instead of LightBoost, I miss having the strobe length setting. In the future, I really hope that enabling it on ULMB will be possible through a simple driver update. I have confirmed that both major 120Hz monitor manufacturers now pay attention to this new forum, including NVIDIA, ASUS and BENQ. One ASUS rep has already registered as a member (ASUSTEKMKT), and there are others as well. The purpose of this thread is also to remind the vendors of the need of adjustable persistence in any future strobe backlight. Yeah, that's why it needs to be easy to turn ON/OFF all strobe backlights. We know that not everyone likes LightBoost, and 144Hz (and GSYNC) are more appealing options for some. That said, this thread is specifically to survey specifically only LightBoost=10% users, to show they do exist. You can add me to the list, I use lightboost at 10% brightness 120Hz only when playing games as it's too dim for everyday use, 121Hz non strobed when not gaming. 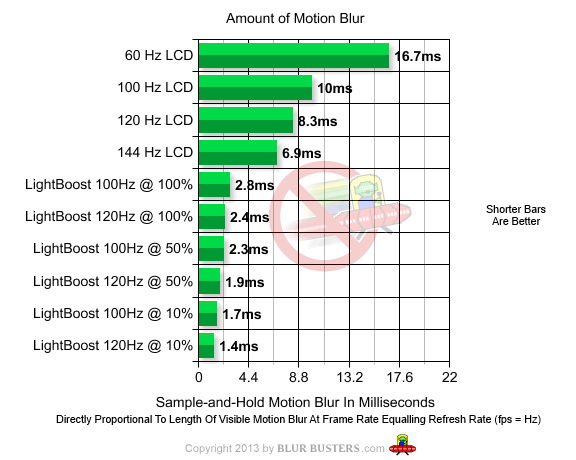 We need brighter strobing monitors with the motion clarity of lightboost at 10%. For those that have installed the upgrade kit how does ULMB compare to lightboost at 10%? sharknice you say motion clarity is not as good? is ULMB brighter than lightboost? I'm still on the fence about weather to buy the upgrade kit or not, either way I'll be pulling apart the monitor and removing the matte film. Hawke wrote: For those that have installed the upgrade kit how does ULMB compare to lightboost at 10%? sharknice you say motion clarity is not as good? is ULMB brighter than lightboost? ULMB is roughly equal to LightBoost=60% on my GSYNC monitor, and is roughly the same brightness, too. (See the other ULMB threads for this talk). I don't have a Lightboost monitor, but my friend who is an avid gamer uses it when he plays competitively, but turns it off most other times, due to the poor colors.